From Cicero to Snooki, the cultural influences on our American presidents are powerful and plentiful. Thomas Jefferson famously said "I cannot live without books," and his library backed up the claim, later becoming the backbone of the new Library of Congress. Jimmy Carter watched hundreds of movies in his White House, while Ronald Reagan starred in a few in his own time. 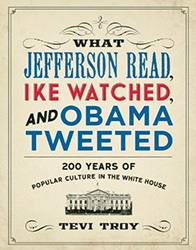 Lincoln was a theater-goer, while Obama kicked back at home to a few episodes of HBO's "The Wire."